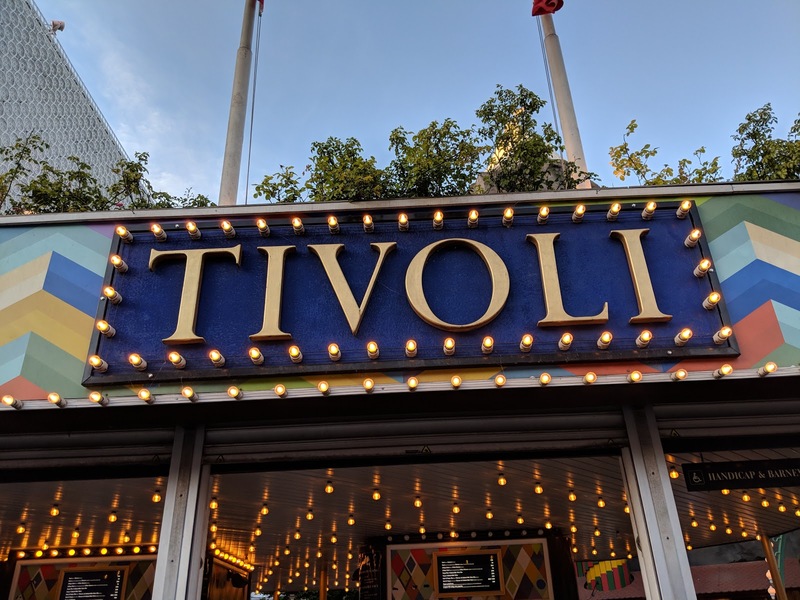 "Tivoli will never, so to speak, be finished." I can clearly remember my first trip to Disneyland. It was the day after Christmas 1995. All the rides, the food and the shows were amazing. Since then, I've gone with family and friends through the years. Most recently, we've taken our own family and seeing the wonder of Disney through our children's eyes. Disneyland always brings a sense of joy to anyone. Being in Copenhagen, we went to the one of the world's oldest amusement parks that inspired Walt Disney to create Disneyland - Tivoli Gardens. 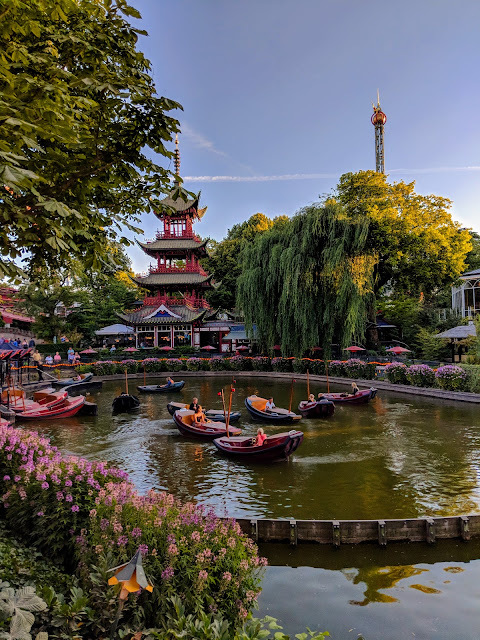 Tivoli Gardens or simple Tivoli is both a pleasure garden and amusement park, located in the heart of Copenhagen. The park has three entrances and is completely gated in. There is an admission fee to enter the park - adult ticket prices run 120DKK and children prices have two tier prices, ages 3-7 50DKK and ages 8+ 108DKK. If you want to do rides, you can pay as you go or pay for unlimited ride tickets. As we were walking towards Tivoli, France had just won the 2018 World Cup in Russia and up and down the streets, we saw and heard many people celebrating the win. The little lady has been looking forward to Tivoli since we showed her pictures and videos of the place, except, we get within five minutes of entering and she had fallen asleep. 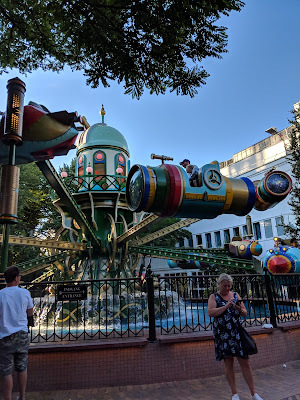 Having bought a Copenhagen Card (more on that later), Tivoli is one of the many attractions that you can get into for free - the hubby and I decided to just have a "date" with our sleeping littles in tow. We also did for our visit to the Copenhagen Zoo and Den Blå Planet. We can clearly see the areas that inspired Walt Disney to create Disneyland from the restaurant awnings to the uniforms, even some of the rides. I am only sharing a few of the pictures that I was able to take of the rides - to the left is the Star Flyer and the two down below are The Astronomer and The Ballongyngen. The Star Flyer is one of the world's tallest carousels and provides you with one of the better views of Copenhagen's historical towers and rooftops. The symbols on the ride are a tribute to Tycho Brahe, a Danish astronomer. The Astronomer takers you on a ride equipped with moving telescopes and rotating satellites. The Ballongyngen or Balloon Swing is a classic Tivoli favorite for both young and old. The very first photo above is of the Dragon Tugboats, located roughly in the middle of the gardens, with the Star Flyer in the background. I took the photo from the bridge walkway and the sun was still high in the sky. This was roughly 8pm. I'm sure if I took the same picture after the sun had set and all the lights have been turned on, it would have made for an amazing sight... and picture. Below is a picture of one of the three entrances into the park. This one is directly across the Copenhagen Central Train Station. Tivoli, just like Disneyland, makes you want to come back again and again.